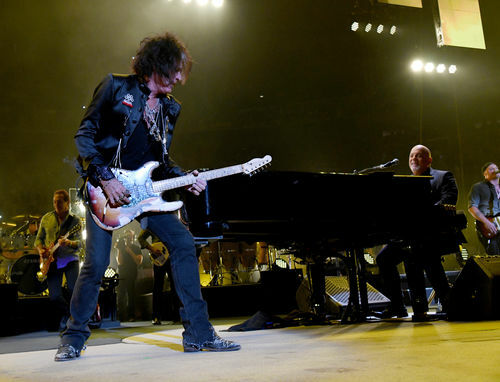 Joe Perry was rushed to the hospital after performing with Billy Joel on Saturday night. The Aerosmith guitarist joined Joel on stage at Madison Square Garden to perform "Walk this Way" for the audience. Moments after leaving the stage, however, Perry reportedly collapsed in his dressing room. Paramedics were quickly called to the scene and Perry was ultimately rushed to the hospital to be treated. As of now, there are no details on what, exactly, went wrong with Perry following his set with Joel. Sources present backstage told TMZ that Perry "looked terrible" and that there was "panic in the dressing room" as the paramedics worked on the guitarist for 40 minutes. TMZ also reports that a tracheal tube was put in Perry's throat to give him oxygen.